A bird's feathers represents more than just gaudy plumage. In many cultures across the globe, feathers are believed hold spiritual power, as such, they are integral parts of many tribal rituals. From as far back as the early days of mankind, humans have always valued feathers for their beauty. For many, the feathers of a particular bird are considered to be sacred gifts from the gods and they are treated with the highest degree of reverence that the members of the tribe can possibly bestow. From the thick forests of Papua New Guinea to the almost impenetrable jungles of the Amazon, there have been countless documented cases of tribal ceremonies incorporating the feathers from a particular avian as a way to pay tribute to the gods. Due to their association with the gods, feathers are often seen as symbols of status and authority. The most eye-catching plumage is normally reserved only for the tribe's most respected members in the belief that only they are worthy of making use of the heavenly gifts. The Druids were believed to wear cloaks made of feathers in order to evoke the spirits of the sky god and allowed the priests to communicate with this all-powerful being. Feathers are also symbolic of knowledge. One of the earliest writing instruments, the quill pen, was actually a bird's feather. The best quills came from swans and were equivalent to writing with today's most high tech fountain pen. For the equivalent to today's regular 10¢ variety pen, a Goose's feathers would have been called into action. As time and mankind's collective knowledge marched on, feathers gave way to fountain pens. Nowadays, the thought of chasing a chicken to pluck out its feathers and use them as writing instruments seem as far-fetched to us and the concepts of Facebook and Google are to a medieval peasant. In another aspect, feathers were (and still are) used extensively to apply ointments, pigments, and oils. Native American Tribes view eagle feathers are a sign of Healing and Medicine, thanks in part to this long standing practice. Feathers, in particular eagle feathers, are held in such high regard in the Native American community, that it is not uncommon for parents to name their children in honor of this revered bird's plumage. Early Christians often used a number of coded signs to convey their religious affiliations. One such design was a three feather symbol, with each feather representing the core virtues of Faith, Hope, and Charity. Tradition has it that only the virtuous could wear rings with this three feather symbol and anyone interacting with these individuals could do so without fear of being cheated or scammed. We are not too sure that the three feather ring would hold up to today's stringent security measures. From the icy blues of a peacock's feathers to the fiery reds of a phoenix, Feather Tattoos come in all shapes, sizes, and colors. Just as there are thousands of birds drifting across the clear blue sky, there are thousands of meanings to Feather Tattoos. Artists, in general, try to play up a particular cultural link with a design in order to center the design's significance to you, the wearer, and give you a cultural context in which to view your tattoo. With that being said, there are several types of bird feathers that have become symbolic of certain traits. The Peacock is much more than just a narcissistic bird. It is a symbol of the Beauty, Grace, and Elegance that could only be exuded by someone who is comfortable in their own skin. But did you know that Peacocks also have a strong religious connection? In Christianity, a peacock is symbolic of Renewal and Resurrection, as such, its feathers are often used to represent one of the most poignant events in the Christian faith - the resurrection of Jesus Christ. Early Christian artists and Renaissance painters often incorporated peacocks into their artwork to pay homage to Christ. During the Easter season, peacock feathers are used to decorate churches worldwide. Ostrich Feathers also embody the same message of Renewal and Rebirth. Additionally, Ostrich Feathers are symbols of Truth and Justice. In ancient Egypt, Maat, the goddess of Balance, Truth, and Justice was depicted with an ostrich feather in her hair. As the legend goes, the hearts of the dead would be weighed against the feather. Those with a pure heart and a clean spirit would be allowed to pass through the Afterlife, but those who were found wanting would be given a second death. Aside from the religious context, Peacock and Ostrich feathers have an air of mystery, sexuality, and seductive appeal. This is thanks to the early burlesque dancers of the roaring 1920s and 1930s who often incorporated them in their acts as clever accessories used to hide their modest assets from the public eye. An eagle is a noble being of honor and valor. In the Native American tradition, it is the revered earthly incarnation of the all-mighty Thunderbird spirit and an emblem of spiritual power and purity. Tribal leaders and medicine men often use eagle feathers as an important part of sacred rituals, many of which are done to celebrate the tribe's victory, commemorate the spirits of the ancestors and the Earth, and to heal the tribe's sick or comfort its dying. As such, Eagle Feather Tattoos symbolise Healing, Medicine, and Renewal. The Phoenix is born from Hellfire and ash. It struggles to overcome life's most gruelling challenges to rise up stronger and better than ever before. The bird is symbolic of Resurrection, Renewal, and Immortality. According to ancient Greek mythology, receiving the feather of a Phoenix granted you eternal life. Since it is hard to find a phoenix feather in the universe, then maybe a Phoenix Feather Tattoo will give you the power to conquer time and age? 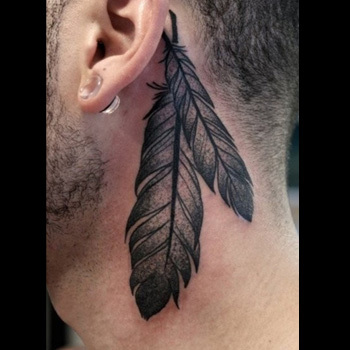 When it comes to Feather Tattoos, the designs are usually full of symbolism and color. Every element brings with it a spiritual and cultural context that allows you to create a piece that truly speaks to your message and personality. It can be tricky trying to craft a piece that will stand the test of time because there are many factors which influence how your artwork will be perceived by both you and the world on a whole. If you need inspiration, then take advantage of our Custom Design Service. Our team would be more than happy to help design a truly unique piece for you.